Hello, I am back with a yummy recipe for an easy to put together salad! This one is by far our most favorite out of all the salads... hands down! I make it anytime I am short on food or if I am only a little bit hungry. My husband requests it a lot therefor I had to come up with some variations so it doesn't get old. In a bowl, throw together lettuce (or spinach), walnuts, feta cheese, and blackberries. Easy enough right? But now comes the real thing that gives the salad the right twist: pour over the salad some Brianna's Home Style Poppy Seed dressing! Unfortunately, you will not be able to get away with just any dressing. This is the one and only that will make the taste unforgettable! 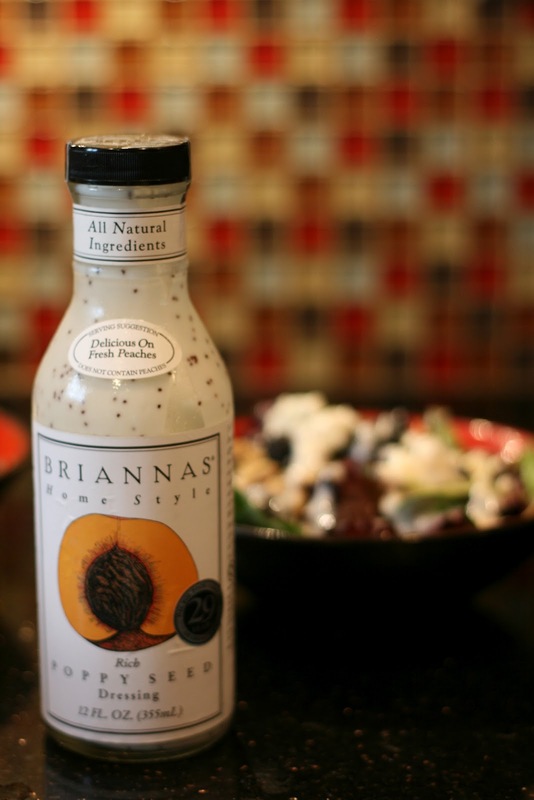 But be aware that this dressing tastes a bit sweet with just a hint of sourness. You can substitute the fruit for any other salad worthy fruit, such as kiwi, strawberries (those taste especially good with feta and walnuts), apples, raspberries, or blueberries.